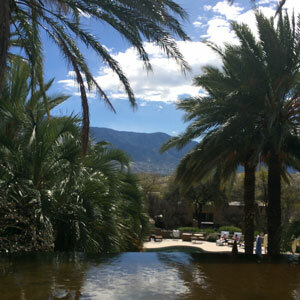 Sometimes a girl just needs to take a moment for herself…so I took a “week” at the Miraval Resort and Spa in Tucson, Arizona last week to recharge. I can’t take all of the credit for the idea. It was actually my friend Cindy’s husband, Michael, who came up with the grand plan to surprise his wife for her fortieth birthday with a girl’s spa week. He enlisted myself, and our mutual friend Dana, to join her for a week of pampering, mental clarity, and relaxation. Once we got there, it took me all of about fifteen minutes to get into the “Miraval way” by turning off my sidekick- otherwise known as my cell phone. With her vibrating interruptions no longer on my radar, I quickly got into the cadence of my own bodies beautiful rhythm. I woke up when my internal clock decided to and not because my sidekick told me to do so. I took long walks and actually took in the deserts views without checking in on Perez Hilton or The Huffington Post. Shocking, I know. My friends and I bonded and laughed like we used to. 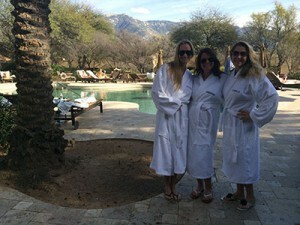 We pampered ourselves at the spa and savored in the chef’s daily delights- all low carb of coarse. We did it all, and it was heavenly. 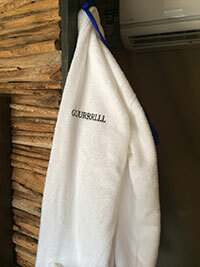 When we were not in yoga gear, the three of us meandered through the resort in our very own personally monogrammed robe’s, a gift from Cindy’s husband. Yes, he thought of everything. (On a side note, you have my permission to show this blog to your husbands.) The name on my robe was, “Giiiirrrrrllll”, which was fitting in that I routinely start every story with the word girl. My take-a-ways of the week were plentiful. You can still gain weight when you subtract carbs from your diet but add vino in its place. Doing equine therapy can be quite insightful. I am still scared of being kicked by a horse but that is an entirely different story from childhood. Tejpal, an intuitive, told me that my soul was here to transform others and show them their way. Thank you for that validation universe. She also gave me my soul’s song recorded with a harp to play everyday or just when I am just feeling blue. I am telling you they take all inclusive to the highest frequency. On my last day, I joined Dana for a transforming talk given by Mark Pirtle, the resort’s Stress Illness Specialist. It was there that I realized why we ladies like to “spa it up” and pamper ourselves to the max these days. We get mani’s and pedi’s, highlights and low lights, and cocktails and fillers all in need of some glorious time alone. Yes, alone. I mean we want to look good, but we also want to feel good. 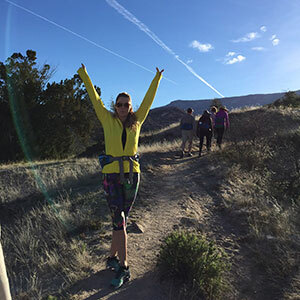 Miraval started out as a rehabilitation center for drugs and alcohol treatment. As Mark so poignantly put it, we come to a spa like Miraval as a healthy pre-rehab so that we don’t end up in an actual rehab! Take your time to enjoy yourself. Break up with your schedule and just live in the moment. When the mind gets quiet wonderful things can come to fruition.